It is now almost apparent that Nigeria has “leaders”, important people in society, et cetera who neither cares about the masses, nor love this country enough to want to see Buhari succeed. How could anyone be dredging out the old “oil subsidy”, a scam, as it has become known throughout Nigeria? How could anyone who claim to love Nigeria – if not the downtrodden masses – suggest the privatization of the National Petroleum Corporation? Who are those interested, willing and capable of sitting down to write a cheque/check for billions and billions of US DOLLARS to pay for the purchase? I’m not sure the number of times the so-called “subsidy” has been removed: from retired General Obasanjo’s through Dr. E.G. 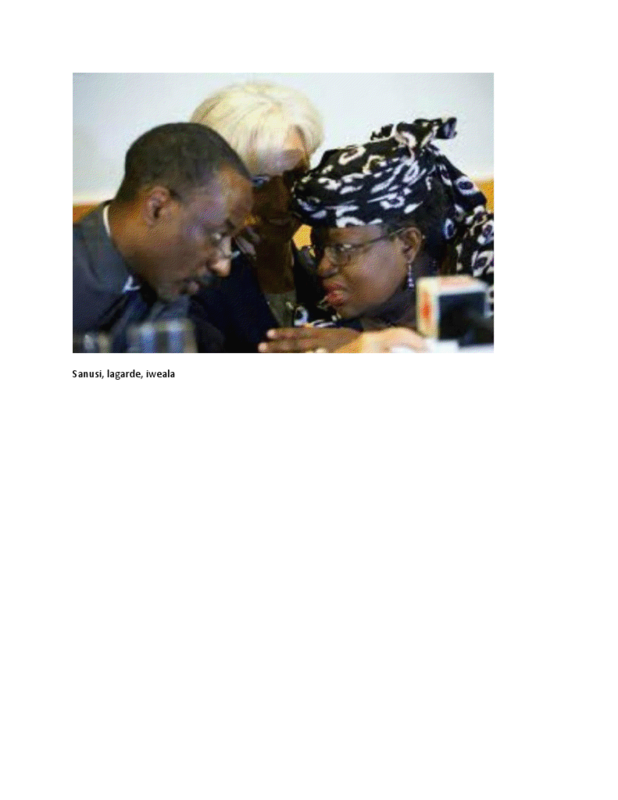 Jonathan’s presidencies, including the one engineered in the dead of night as Nigerians awaited New Year’s Day 2012 with a surreptitious visit by the Honorable IMF MD to her friend, Nigeria’s first and last Economy Czarina, the Honorable Dr. Ngozi Iweala. Now that the president has called a halt to these distractions – at home and in far-away Washington, D.C., I think it’s the right time to remind ourselves – if we have forgotten – the real beneficiaries of the scam known as “oil subsidy” as the list was released in 2011 by the Nigerian Senate. For old time’s sake, the list can be reached through a link at the end of today’s essay but here is a picture from a posting after the removal of what, if truth be told may be real subsidy but it was not to the Nigerian public. It was a scam, a racket. I just reblogged it today: “When Her Imperial Majesty, the Honorable Christine Lagarde,IMF M.D. came to town”, a Fly-on-the-wall-commentary. Speaking to Nigerians who had come to see and feel him for the first time since his ascendancy to the presidency, President Muhammadu Buhari gave an idea the path his leadership would take, dismissing, perhaps for the last time, the needless calls for him to name his Ministers, to “remove oil subsidy”, … He also alluded to the derisive name, “Baba Go Slow” – an old man who’s moving too slowly in governance” – that is rampant in public through subterranean campaigns by those not intent on real “change” in Nigeria. Buhari promised to use indictment documents that are being compiled to nail top government officials who carried out “mind boggling” looting of the common wealth by moving as much as up to :one million barrels of crude per day for their personal purposes. He promised to trace and recover stolen oil billions through shipping documents’ destinations and accounts to which funds were credited. He told his stunned audience that government officials involved in the criminal activity opened as many as five PERSONAL accounts into which lodgements were made. As for the “oil subsidy bogey that had been used since Obasanjo’s presidency to harass and torment the masses while the real subsidy beneficiaries smiled all the way to banks, he wondered aloud: “who is subsidising who?” He also lamented on the cruelty of “N500 per liter” petrol: “where will they ‘the masses] get the money to go to work? How can they feed their families? How can they pay rent?… and said that might be okay if Nigeria was not an oil-producing country. Hopefully, the hopes of those planning to own Nigeria by purchasing the country’s NNPC after having plundered it for years would now end. There have been massive pressure through newspapers and other media about the need to privatize the National Oil Corporation but Nigerians are not fooled because such privatization in the recent past of “democratic” rule ended in the GIFTING of public enterprises for pittance to selected individuals. I was chanced to be at the Embassy yesterday when PMB really talked like someone who has the interest of the mother land at heart. He jokingly referred to being called ‘Baba go slow’. He said he accepted the name tag but he added that he needs to go slowly to clean up the mess left behind by His predecessor. It was a great day for all the Nigerians at the embassy who had travelled down to Washington to listen to PMB. I’m sure every Nigerian who has read the news reports are as elated as those of our compatriots who flew in from hundreds, and even thousands of miles to welcome the president as well as to listen to him. Nigerians should, and can “keep hope alive” to borrow Jesse Jackson’s popular refrain with Buhsri at the helm.